Nandana’s owner, Gigi Gutierrez, petite and soft- spoken talks about the wood in the way you talk about a longtime friend. Gigi had told me the story of Nandana’s teak on the 45-minute drive from Freeport Airport to her home in Old Bahama Bay in West End, Grand Bahama. Purchased in India at Anuradha Timber, Nandana’s 200 massive teak logs were cause for celebration. Upon arriving to check on their shipment of Burmese teak, Gigi and her husband Patrick Salisbury were surprised by a parade in their honour. Their entire shipment of teak was blessed before being packed into eight 40-foot containers and sent on its journey to the Bahamas. Each room in the home contains at least one piece of the blessed wood, and the feeling of that blessing within the walls of Nandana is almost tangible. “It was such a good way to start,” recalls Gigi. Gigi and I are greeted at the front door of Nandana with the house specialty, wonderfully tangy limeade. From the living area, the western view of the Atlantic Ocean is spectacular. Nandana is designed to keep the eye traveling along surfaces, through doorways and always, always, out towards that magnificent view. 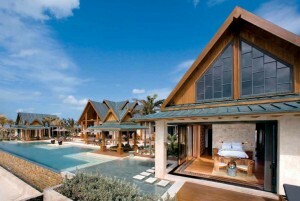 An infinity pool stretches the full length of the house and creates delineation between the house and the sea. The pool becomes an extension of the sun-drenched patio. The 10,000-square -foot home never appears too large. spaces are intimate and instantly familiar. The teak is everywhere, the smoothness and softness combined with fantastic touches of brilliant stones, tiles, and marble. 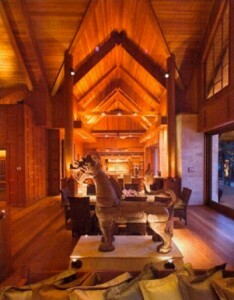 The textures are perfectly balanced, teak gives way to stone and water and silk. large- scale artwork and artifacts collected from many trips add punches of colour and interest. The detail in the woodwork in unsurpassed. 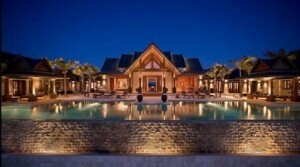 The Burmese logs that eventually made it all the way to the Bahamas were all milled on site and each piece fits precisely within the puzzle of all that teak. And yet, it never seems overwhelming. Gigi tells me more about her home, “We were here in the Bahamas on a fishing trip and Grand Bahama was our last stop. We were boating along a canal and my husband asked me if I would like to own a piece of paradise!” And so they built Nandana together. After almost five years of construction, the result is a work of art designed to bring families together, but also to give them their own personal space. The heart of Nandana is the pool deck, and you always end up there, the view pulls you towards it. The home’s four main bedrooms all focus your attention to the view. And each of these well-appointed rooms has been designed to deliver a casual but highly luxurious experience. The main house at Nandana is peaceful. And then there is the tent. Gigi walks me to the eastern side of the property, saying, “let me show you our fifth bedroom!” An Indian tent sits adjacent to the main house. Nearly 2,000 square feet of surprise from the moment you step through its flap door and into a room that makes you think you are on safari. Cream- coloured canvas creates a private oasis that is so unexpected. Complete with a luxurious bed, expansive overstuffed couches in possibly the world’s most comfortable sitting area, and views of the canal at Old Bahama Bay and the sound of wind in the coconut palms just outside. Each breath of chilly air makes the walls move ever so slightly and the gentle flap of canvas in the wind is rhythmic. The fully collapsible tent (and it has been dismantled for hurricanes in the past) has all of the modern conveniences you expect, including plumping and electricity, television, Internet and air-conditioning but these are all well balanced with safari-styled furnishings. It is a secret hideaway. I’m sure this is the room that everyone argues over. 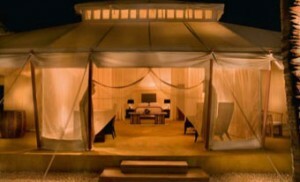 After a stay at Aman resorts in Rajasthan, India, they knew that a tent was the perfect fifth bedroom. The tent was an afterthought but such a good one. Back in the main house, Patrick serves us lunch on the patio between the dining room and the pool deck. It gives us the chance to sit back and really enjoy the feeling of the house. Nandana blurs the line between indoors and out. Each room flows naturally to the outside and the outside laps just as naturally at the threshold of each room. The quiet is staggering: the sounds of wind, waves, materials, and leaves, and nothing else. The artifacts of great travels are everywhere. Nandana captures the spirit of these travels, particularly those to Thailand, where they were inspired after a visit to the Jim Thompson Thai House and Museum. “After we went there, I said to my husband, I know what I want our house to look like,” Gigi recalls. Originally from California, Gigi and Pat have travelled extensively throughout Vietnam, Cambodia, India, Africa, saudi Arabia and Europe, and their home is filled with reminders of those journeys together. “We picked out every little stitch in the entire house”. Impressive carved teak desk in the business centre to the delicate Iranian rugs in hues of silver, blue and rose in the living and dining rooms and the Thai silk dining room chair cushions.